Dr. Carl Wierks, who is also a U.S. Snowboard Team physician, stopped by WZZM 13 Morning News to share some safety tips for the upcoming snowboard/ski season. View the video above! GRAND RAPIDS, MICH. – West Michigan’s skiers and snowboarders are loving what mother nature served up earlier than usual this year — but there are some important things to keep in mind to avoid unnecessary injuries. 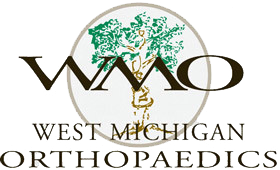 Dr. Carl Wierks is a U.S. Snowboard Team physician and West Michigan Orthopedics partner. He joined the WZZM 13 Morning News to share some safety tips. When it comes to getting in shape for the season, he recommends “spending a few weeks to a month conditioning your body for the sport; you’ll enjoy it more. “Skiing and snowboarding rely heavily on core and thigh muscles. Two exercises that can be done at home are wall sits and planks. Wall sits: To perform a wall sit, place your back against the wall and slide down to a “sitting” position. Try to hold this position for one or two minutes. Planks: To perform a plank, lie on the floor and prop yourself up on your elbows, keeping your body rigid like a plank of wood. Again, try to hold this position for a minute or two. Falling can be a major source of injury, he has some advice If you fall. Hydrating properly is also important. “Be careful not to become dehydrated,” Dr. Wierks continued. “Drink plenty of water in the days leading up and curb alcohol consumption. When it comes to gear, you want to make sure you are using the right size first and foremost. “When purchasing skis or a snowboard, be sure to select the length and style right for your height and skill level,” he said. “A rule of thumb for snowboard sizing: When the board is standing upright, the end should be between your chin and nose.